Observation - Xmas in October - Southern Africa. Description: Parasitic plant with round leaves and smooth stalked red/orange berries. Attached to Euclea? 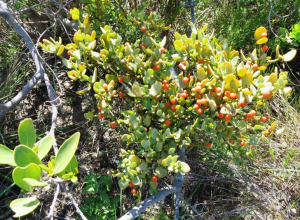 Parasitic plant with round leaves and smooth stalked red/orange berries. Attached to Euclea?